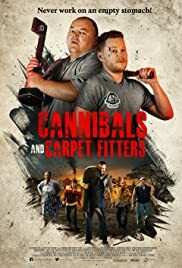 Director: James BusheWriters: Richard Lee O'DonnellStars: Darren Sean Enright, Richard Lee O'Donnell, Zara PhythianSummary: A group of carpet fitters are sent on a job to an old Country house in the middle of nowhere. However they soon discover it's a trap set up by the savage, cannibalistic family, The Hannings. The carpet fitters are forced to fight for their lives or risk ending up being the evenings dinner. Unfortunately they are not quite your typical heroes!